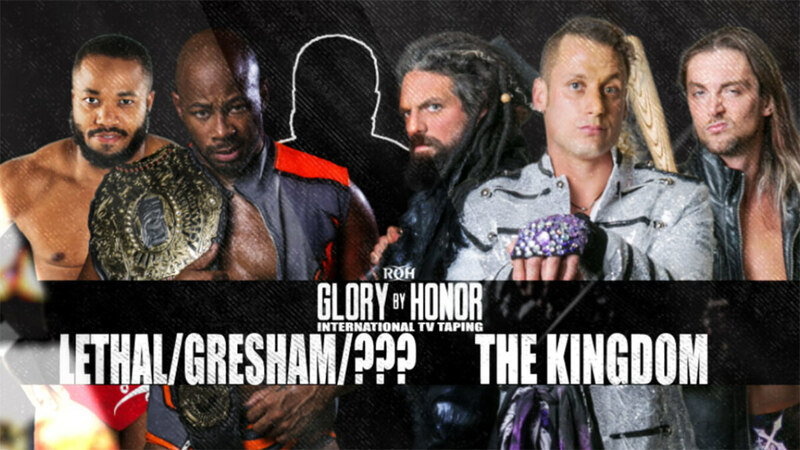 Ring of Honor came to the 2300 Arena in Philadelphia, Pennsylvania on Sunday night for a set of television tapings. King faked that Cody hit him with the IWGP United States Heavyweight title. Todd Sinclair came out to tell the referee what happened, and King shoved Sinclair for the DQ. King kicked Cody in the groin, then ROH World Champion Jay Lethal came out to make the save for Brandi Rhodes. King hit Lethal with Cody's title. Cody and Lethal got up and held each other's belts before giving them back and shaking hands. Cobb and Hangman Page had a staredown after the match. They beat up ring crew guys who came out. - SoCal Uncensored did a promo segment to set up them challenging for the ROH Tag Team titles later in the night. The Briscoes attacked them, with Christopher Daniels being given the Jay Driller on the stage. Castle returned from injury as Lethal and Gresham's mystery partner. The stipulation for this match was that Bully Ray and Gordon each picked wrestlers to represent them. If Young won, Bully could do whatever he wanted to Gordon. If Sandman won, Gordon could do whatever he wanted to Bully. Bully gave Gordon shots with a Singapore cane as part of the stipulation and then low blowed him. - Dalton Castle did a promo about being back and wanting to win the ROH World Championship again. It led to The Kingdom laying out Castle and The Boys. This was the fourth match in their series, with Scurll and Helms each having a win over each other and one match having ended without a clear winner. They shook hands after the match and Scurll praised Helms on the mic. Daniels came out in a neck brace after the match due to The Briscoes' attack from earlier in the show. After the tapings, a segment with SCU and The Young Bucks closed the night.